A thin, light, extremely bright thread that evokes luxury and elegance and that characterises exclusive creations, adding personality to today’s fashion. The “magic ingredient” which gives light and colour to today’s style is Sinflex® Lamé. Filati Sinflex® acquires the metal-plastic fibre and applies it to different raw materials including wool, silk, cashmere and Tactel. Filati Sinflex® is an enterprise with a very long tradition that operates in the district of Biella and that has a strong and deep-rooted vocation for producing quality textiles. Over the years, the company has specialised in this particular sector, which requires very special skills as very few other companies in Italy carry out the processes involved. “We are proud to present an entirely new collection to our customers” says the sales manager Luca Lovero, who is in charge of contacts with the customers and product development. “We propose over 400 colours: 188 of these have been specifically developed for the weaving industry, while the others are ideal for the knitwear sector”. And in actual fact, the range of colours proposed in the new “Luca Lovero Collection” is quite extraordinary. The lamé yarn takes on interesting and unusual hues. It changes into a versatile material that can easily be matched with both traditional and more unconventional types of yarns. It is also ideal to “light up” and add a bright touch to the fabrics that follow the latest and most refined fashion trends. Sinflex® customers are mainly Italian when it comes to products for the weaving and knitwear industries, while the sewing yarn sector attracts many customers from the United States and Japan. “We give our clientele the possibility to choose the solution that is best in line with their tastes,” explains Mr. Lovero. “We do this by proposing innovative, creative and different ideas to each and every one of them. And it is precisely this exclusive relationship we have with our customers that distinguishes us from the rest. There are, in fact, other manufacturers of metal-plastic yarns: our objective is to be a point of reference for those who look for a top-quality and highly creative Italian product. Sinflex® is a registered trademark which clearly identifies Italian lamé. It is not to be confused with Lurex, which is, on the other hand, a metal-plastic product realised in France. There is also a Chinese lamé – continues the entrepreneur, though he does not conceal his doubts as to the quality of the products which come from this area of the world – but it does not undergo the necessary tests in the country of origin and often does not comply with the quality and safety standards provided for by the European Union”. In fact, if the dyes are not adequately tested, they can cause problems when they come into contat with the skin, mainly allergies. “The processing carried out in Italy costs more and consequently has repercussions on the prices of the finished good. But every stage of the processing phase undergoes strict quality tests. In any case, our Chinese competitors supply the lower end of the market with common products. We have expressly avoided this target and aim at the medium-upper end of the market. We also realise exclusive collections for a selected clientele which, thanks to their uniqueness, can thus allow our customers to distinguish themselves from one another”. Mr. Lovero faces the problem of the Chinese threat with great clearness of mind and determination. “It is useless to increase the duties and protection measures”, he says. “Those who look for a guarantee of quality will turn to Italy and will continue to do so, even if they have to spend a little more. We have to “fight” against the introduction of Chinese products on a daily basis, and we have to do so by taking pride in being Italian. Moreover, it must be said that, in this particular sector, Chinese products are really not comparable to ours. Not to mention the fact that the collections arrive “late”: they have to be developed, realised and imported, while in Italy we can follow the evolutions of the trends as they occur, immediately responding to the demands of the Western markets. We create a customised product, deliver it promptly and guarantee its quality. But, of course, allow me to mention that there are a few questionable entrepreneurs who develop their sample collections in Italy and then have them produced in China”. Mr. Lovero is personally involved in developing unique products, specifically designed for the textile industries with which he works. “We believe that developing “private collections” in collaboration with our clients is the best solution to the demands of the spinning and weaving industries, which use our products in a more creative way. According to the specific demands we receive, we invent unique, absolutely exclusive yarns that are very difficult to copy. To guarantee this “uniqueness”, we carry out all the processing phases within our company. This protects our products from anyone who may want to copy them. The divisions are off limits to anyone who is not a Sinflex® employee”. Another possible market for the most original yarns created by Sinflex® is the textile accessories sector. These add a personal touch to the clothing items and highlight their originality. “We have developed interesting collaborations in this sector with other Italian and foreign companies and we once again believe it essential to have a direct and constructive relationship with our clientele”. Applying the Sinflex® lamé yarn to the other fibres is one of the most delicate and, at the same time, most creative phases of the manufacturing process. “It is extremely stimulating to discover just how many unusual and interesting solutions we can find. We experiment by applying pailettes, man-made fibres and extraordinary raw materials. The results are often unexpected. As a company policy, we do not take part in the trade fairs of the sector” explains Mr. Lovero. “We prefer to invite our customers here and to try to develop ideas and solutions to re-invent their product with our “thread of light”. Not surprisingly, this is a service that our Chinese competitors are not able to offer”. But Chinese competition has undoubtedly contributed to the heavy crisis of the Italian textile industry, and this because of their competitive prices. “To avoid this, it may have been the case to help the Italian entrepreneurs by applying less oppressive taxes and simpler regulations. We are all aware that with the admission of China to the Wto we would have had to face an “invasion” of Chinese products. And it is clear that we cannot compete with them price-wise. Many Italian companies, which export the “Made in Italy” style world-wide, have been realising their products in China, taking advantage of the low-cast labour force, for years. But a “Made in China” label is not a great way for a prestigious Italian company to propose itself on the markets. And to this respect, we should teach the final customer to recognise a quality products”. Luca Lovero also has a clear idea as far as the critical situation of the Biellese district is concerned. “Attracting people to Biella is essential. We have tried to do this with the “Sul Filo della Lana” exhibition. Giorgio Aiazzone (ndr: founder of the furniture company that changed the sales and marketing techniques used in this country) had managed to do so in the past by applying totally innovative business solutions. But it is now extremely hard to achieve this goal. Even the exhibition-event is ten years late. We should have promoted our city, its peculiarities, its indefatigable workers many years ago” states the entrepreneur. “I think this feeling of not being abreast with such a fast-changing world is the greatest gap we have to fill. The Biellese people have never been very open, but isolation is no longer acceptable in this day and age. I think it is time, more than ever before, to face these challenges with pride, to commit ourselves, all together, to supporting our enterprises and to defending our country and our image. The Biellese entrepreneurs should show, today, the same wilfulness and determination they put into creating their companies at the end of the Second World War. 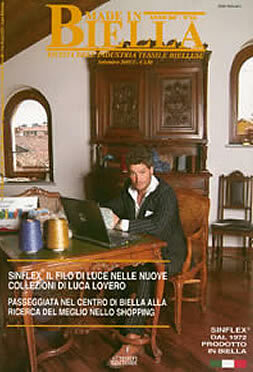 “The only thing we are sure of – continues Luca Lovero with reference to the situation of the “Biella System” – is that we will witness a general streamlining, especially of the larger companies – The Biellese district will have to come to terms with a “revolution” that will generate a more innovative and more specialised system of production. What can we do to make this change smoother? I think that travelling around the world and opening our minds to new cultures and ideas is a possible solution. Another essential aspect is to increase and to continue to distinguish ourselves for the quality of our local textile products, which have always been a synonym of excellent. It is a shame that very few people know that the most beautiful and precious fabrics come from Biella and that the most renowned designers in the world have always been regular customers of this district”. The “Biella the Art of Excellence” label could be the first step in this direction: “It is still not enough and in any case it comes, once again, too late. But still, we hope that it may help to draw attention to our district. There are still many of us who believe we can continue to survive thanks to the creativity and wilfulness that has always been a part of our culture and its enterprise. I think it is important for our customers to be daring and to conceive “charismatic” products. We – concludes Mr. Lovero – try to do this every day by encouraging and proposing, to those who purchase our products, ideas and solutions that can allow them to distinguish themselves, to express their true personality, in a global market that is not always easy to interpret”.